one of the best gifts to gift and/or recieve are candles. candles are amazing because they will last forever AND you can use them throughout the year. one of my favs that is highly mentioned on my blog is the Capri Blue Volcano candle from Anthropologie. the candle smells like sweet citrus with a sugary twist and the aroma can put a smile on anyone's face. beauty items are such great stocking stuffers, or mini add on gifts. in the photo above are just a few of my personal picks. PS: if you haven't tried the colourpop super shock highlighters YOU NEED TO NOW!! this duo set is from ulta and UNDER $15! such a great gift to give to that special someone. as many of you may know i love to practice mindfulness and taking care of myself. one way i implement mindfulness into my life is by writing in guided journals like this one. journaling helps you deep think and get your mind into a state of calm. another way i practice mindfulness is using a rose quartz roller. i was kindly **gifted this one above from the brand, Honey and Be. i'm OBSESSED with it, and you can buy it on amazon now!! after i use my roller (typically at night), i get a good night's rest with my fluffy faux fur pink sleeping mask from Madewell. hi loves! 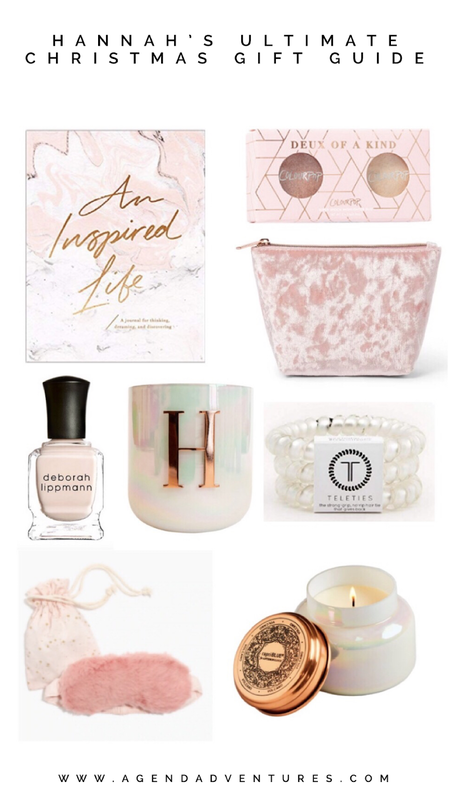 i received so much love on my last gift guide and i felt truly inspired to create another for you all! on today's blog post i'm sharing "for the cozy girl" gift guide. this post is especially made for all the cozy queens out there, like myself (hehe)! just like in my last post (click HERE if you haven't seen it) i found a bunch of cute items and linked them all down below. thank you all so much for your support and love. i feel so blessed to have this platform with amazing followers like you all. enjoy this post, and as always, happy shopping! !